Israeli Foreign Minister Tzipi Livni has sparked controversy by saying a Palestinian state would provide "a national solution" for Israel's Arabs. Politicians from the minority Arab community have demanded she clarify if it means that Arabs citizens will face loss of rights in Israel or expulsion. Israeli politicians have long grappled with the issue of a growing proportion of ethnic Arabs in the Jewish state. "Transfer" has been mooted explicitly only by far right-wingers in Israel. Ms Livni is hoping to become Israel's next prime minister, and opinion polls suggest she is in a close race with the right-wing Likud party. Some Israeli politicians have suggested she may be trying to project a hardline image in an attempt to draw votes away from Likud. 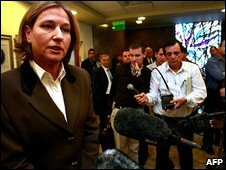 Ms Livni tried to clarify her comments on Friday. "There is no question of carrying out a transfer or forcing them [Israeli Arabs] to leave," she told public radio. "I am willing to give up a part of the country over which I believe we have rights so that Israel will remain a Jewish and democratic state in which citizens have equal rights, whatever their religion," she added. Meanwhile, a prominent far right-wing Likud member, Moshe Feiglin, has been demoted on the party's candidate list. Mr Feiglin, a settler who has espoused extreme anti-Palestinian views, was originally 20th but has been moved to 36th, making his election much less likely. Party officials said the change was for technical reasons relating to the promotion of regional candidates; Mr Feiglin alleged it was politically motivated. In remarks to school children broadcast on Israeli radio, Ms Livni's said her solution for maintaining a Jewish and democratic state of Israel was "to have two distinct national entities". "Among other things I will also be able to approach the Palestinian residents of Israel... and tell them: 'Your national aspirations lie elsewhere.'" Arab MP Ahmed Tibi demanded that Ms Livni be absolutely open about what she meant, as befits a candidate for Israel's prime ministership. "She must decide whether she means to leave 1m Arabs without political rights or a national identity, or whether she really intends to transfer 1m Arab citizens to the Palestinian state that will be established," he told Israeli army radio. "The way to peace is by respecting international legislation. The Israeli election campaign should not be exploited to create tensions," said Palestinian presidency spokesman Abu Rudeina. Israeli Arabs trace their origins to the Palestinians who remained on their property or escaped expulsion in 1948 when Israel was created. They now make up about 20% of the state's population and their numbers are increasing. On paper, they enjoy equal rights with Jewish Israelis - unlike their Palestinian counterparts in the occupied territories - but they have frequently complained of discrimination. Creation of a Palestinian state in the West Bank and Gaza is the object of US-backed Israeli-Palestinian peace talks.